DIRECTOR-General of Governor Willie Obiano Campaign Organisation and former national chairman of the All Progressives Grand Alliance (APGA), Chief Victor Umeh has said that Anambra people cannot be bought with money because they are not idiots as erroneously construed by some politicians whom he said shared money to voters to lure them into casting their votes for them. He said that the Anambra governorship election is a big lesson to politicians who felt they could buy the electorate with money while admonishing them to prepare adequately for their campaigns as well as approach the people with credible issues of development instead of banking on the money they would share to the people to buy votes. 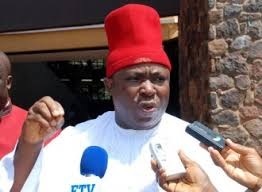 Umeh who addressed journalists at the INEC office Awka on Sunday stressed that Anambra people are not foolish and as such can’t be bought over with money adding that they are wise people who should be allowed to decide who governs them. The DG noted that Obiano performed tremendously well in his first term in office and deserves the mandate of the people for another opportunity to serve them better pointing out that money did not play any role in the election; that they have lost their money in an attempt to bribe the electorate. He maintained that the election is a typical lesson for those who hope to win elections by sharing money. According to him, INEC was neutral in the election as well as surpassed the expectations of all and sundry. Umeh noted that the election was transparent and should be the kind of election that should be recommended to the nation stressing that the outcome of the Anambra governorship election is the collective will and decision of the people of Anambra State. The ex-APGA national chairman also noted that the police, INEC, and other security agencies did not interfere with the conduct of the election instead they devised workable strategies to ensure the smooth conduct of the governorship election in the state. He said that he expects other candidates to congratulate Governor Willie Obiano on his victory at the polls and accept the outcome of the election in good faith and in the spirit of sportsmanship as well as wait for another time to test their popularity amongst the people.